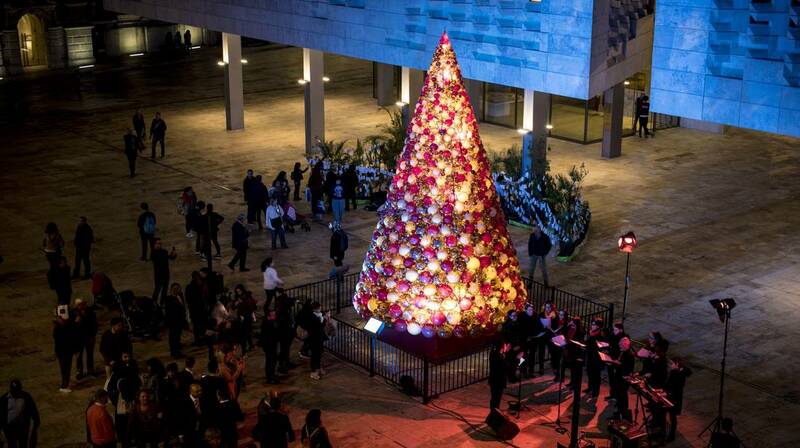 The Mdina Glass tree was lit earlier this evening by Valletta 2018 Chair Jason Micallef and Mdina Glass Managing Director Joseph Said. The Mdina Glass Christmas tree at City Gate was lit this evening by Valletta 2018 Foundation Chairman Jason Micallef, together with Mdina Glass Managing Director Joseph Said. The seven-metre glass tree is situated in front of Parliament Building and is made with over 2,000 handmade glass baubles of varying colours and sizes, attached to an inner structure. The glass sculptures are part of an ongoing collaboration between Valletta 2018 and Mdina Glass, which will be on display throughout all of December.